Attract Your Target Audience to The Website With Electrician Services Template! If you are going to deal with electricity, your job is electrician services, the best way to share information about you is through the Internet. Today's reality persuades consumers to find the most appropriate contractors exactly there. But how to do this? The answer is simple - you should create your own website on the base of the finished template. Well, we've prepared an excellent solution for you. 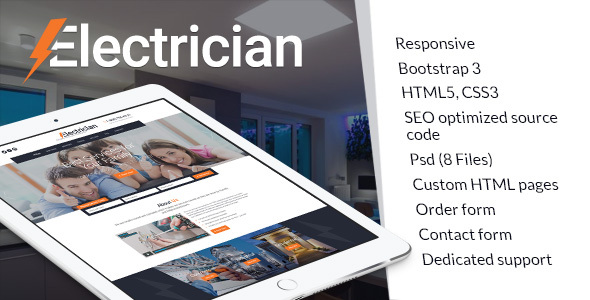 It's responsive bootstrap HTML template for Electrician Services. Now you can create your online project in a fast and easy way without any special knowledge or skills. Use this Premium Html Bootstrap Theme to Achieve Your Goals! 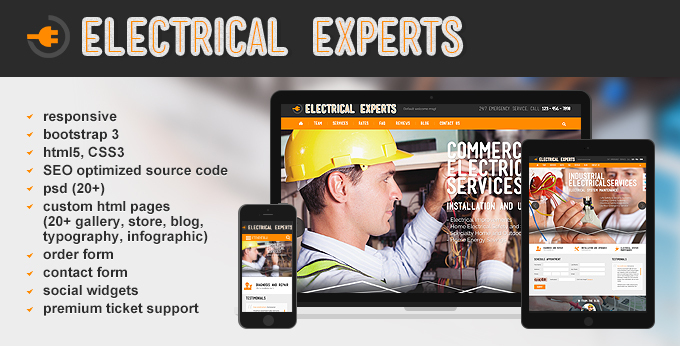 Electrician Services Html5 Website Template is Your Chance to Succeed! You can review design in PSD files. They are currently available for free download at Electrician Services Free PSD template page. To see layers, graphical effects in PSD files you should have Adobe Photoshop software.